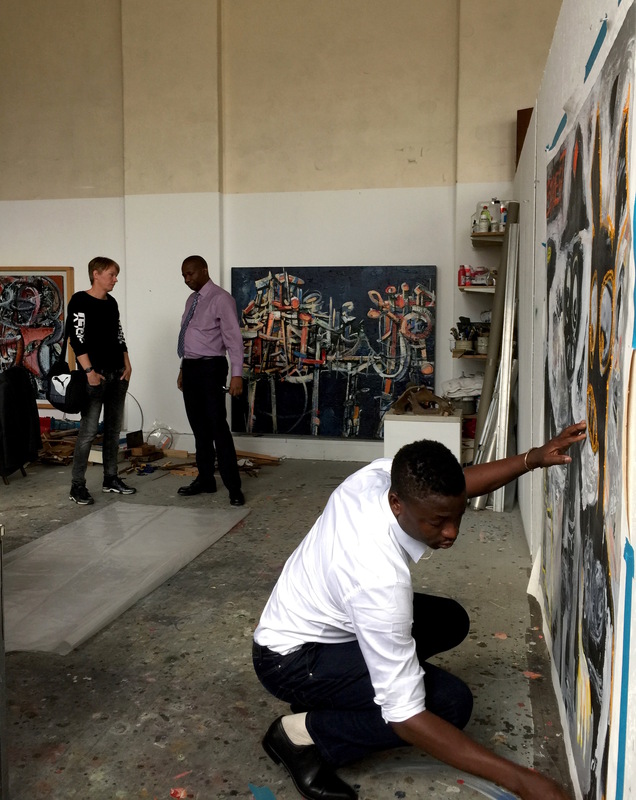 ‘Soon after I opened my gallery in 2012 I became curious about the paintings of Aboudia, an emerging artist from Ivory Coast. 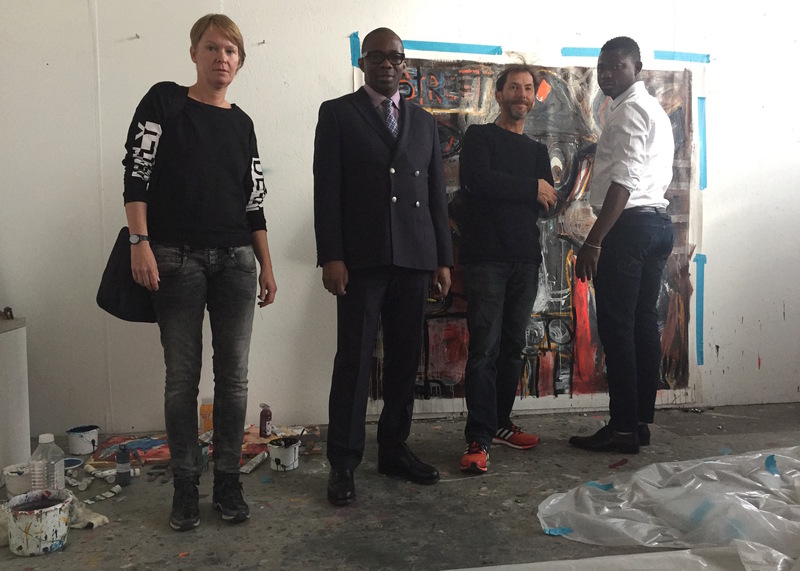 I was showing another emerging African artist at the time, and thought that the two of them would jointly make a wonderful exhibition. Several years later I purchased a medium sized Aboudia painting from an influential New York art collector, Michael Hort. Through this connection I was introduced to Aboudia’s agent Issiaka Toure, and before long I was both a buyer and dealer of Aboudia’s paintings. 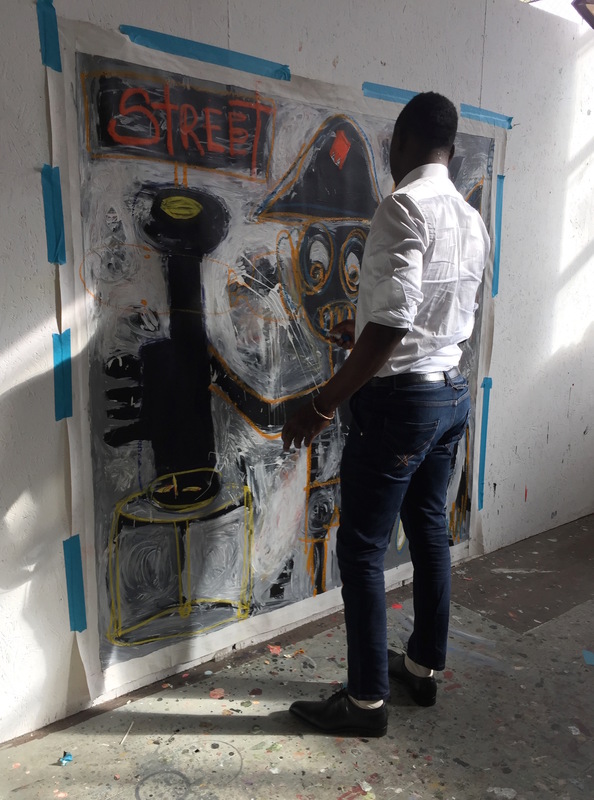 Last Sunday (9th October) Aboudia was painting in my London studio, completing three new pictures which had been shipped to the gallery from his New York studio partially finished. This was a great moment for me and a milestone for the gallery. I was surprised he could work with me watching, and then I remembered he was initially a street artist, and painting in front of people would be natural. Aboudia’s work is easily identifiable with its skeletal figures sketched in oil bar over light ghostly washes of colour. The artist has cleverly brought together his origins as a street artist with an experimental curiosity for multi media and vigorous abstract painting. 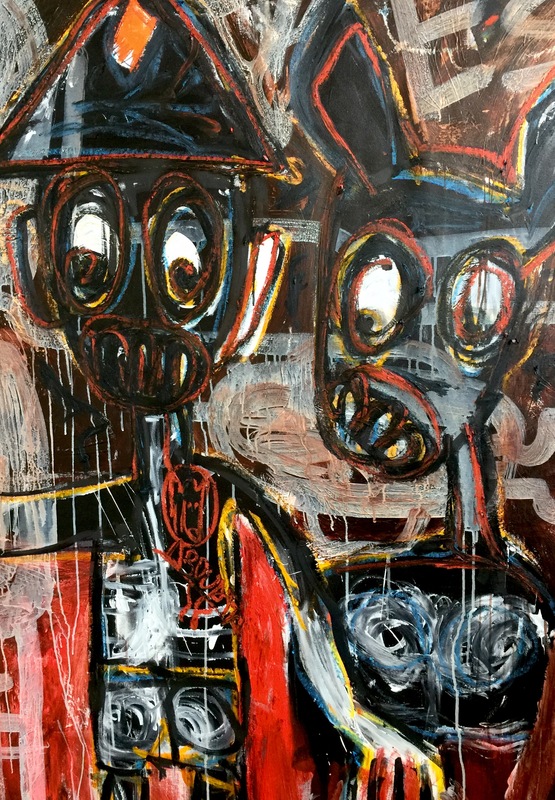 Death seems to play a recurrent role in these paintings, alongside stray animals, African street life, neon signs, traffic, and what seems to be a rather negatively portrayed UN peace keeping army. Aboudia’s homeless years, eight of them, have played a vital role in his imagination. There are also his memories of the 1999 Cote d’Ivoire military coup and its subsequent political skirmishes. Stray animals are a poignant symbol of war, homelessness and poverty. I have a personal interest in fast improvised painting and the way it captures a fixed moment in time. Aboudia above all painters I know has captured these fleeting moments and presented them in a graphic animated style. His world of intense and troubled human activity comes to us through the innocent perception of a self taught artist.